During the Dontaku Festival, many people, young and old, parade through the streets in various costumes, some playing the shamisen or beating drums, others clapping wooden spoons for scoping rice. The festival originates from the local custom dating back to the Heian period (13th century) , called ‘toka’ or ‘matsubayashi,’ during which the local people praised the feudal lord on the occasion of New Year. It is said that the upper class people of Hakata walked around the town on their way back from the castle. The word’Dontaku’comes from the Dutch word ‘Zontag,’ meaning holiday. The festival was first referred to as ‘Dontaku’ in the Meiji period (late 19th century) when the once-prohibited ‘matsubayashi’ was revived. 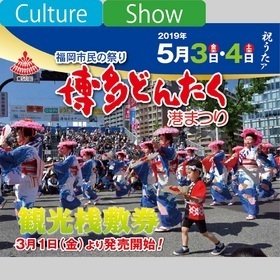 Today it is celebrated as a citizens ‘festival and many people from in and outside Fukuoka, including from overseas, get together on May 3rd and 4th to celebrate. The whole city eagerly awaits the start of one of the most exciting carnivals in Japan.